The Neyers Ranch Cabernet Sauvignon vineyard in the hills of Conn Valley is one of the best spots in Napa Valley for producing great Cabernet Sauvignon. 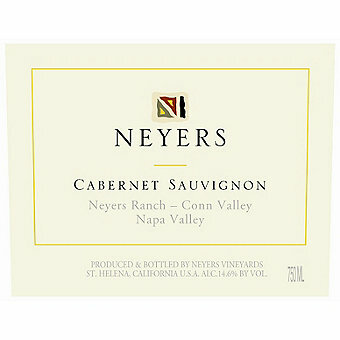 In 1992 Bruce Neyers hired David Abreu to oversee the Cabernet Sauvignon planting on his estate. He hadn't achieved the fame he enjoys today, but there was clearly something special about his approach to grape growing. They had walked the property together for a couple of hours when he announced, "This is great Cabernet land, and I can make this a great vineyard for you." which he did. The Conn Valley Ranch vineyards are located in the hills east of St. Helena, at elevations ranging from 400 to 1200 feet, on a south-facing, 50-acre parcel bisected by Conn Creek. In late 1998, they acted on a long-standing conviction and began to farm these vineyards organically and sustainably. Now, these vines are 20 years old and just entering the 'Sweet Spot' of their productive years. Only 1,122 cases of this 2014 Cab were produced. It's 100% Cabernet Sauvignon from the Conn Valley Ranch Vineyard aged in 40% new French oak. Wine Enthusiast Magazine scored it 94 points saying "This balanced wine is rich in velvety texture, with a backbone of structured tannins and a hint of earthy minerality. The fruit takes on a compelling tone of linzer torte, with layers of juicy blackberry and black cherry, but never veers too far, pulling back on the ripeness to find complexity, harmony and grace."